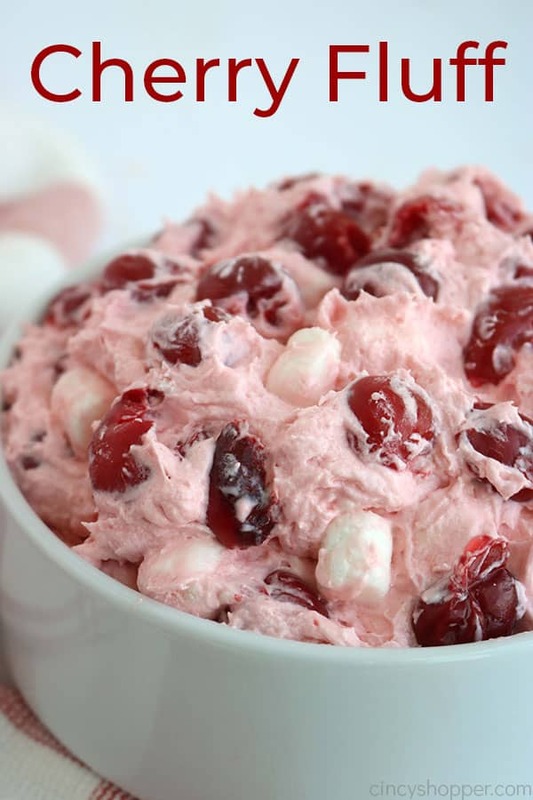 Cherry Fluff Salad is an incredibly easy salad that is light, fluffy and delicious. 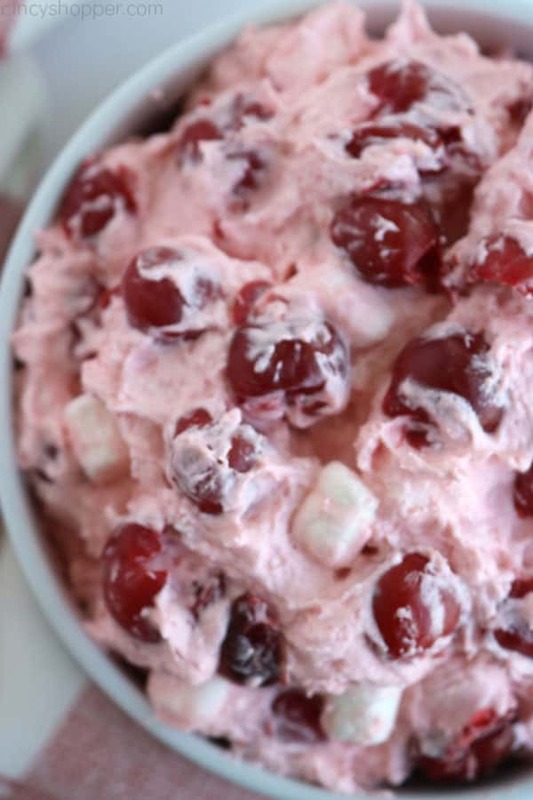 We make it with cherry pie filling, cream cheese, Cool Whip, a bit of sugar and marshmallows. You can have it made it just a few minutes. Dessert salads are always favorite at summer barbeques and potlucks. I often make my Creamy Fruit Salad or a Strawberry Banana Salad because most everyone enjoys fruit. 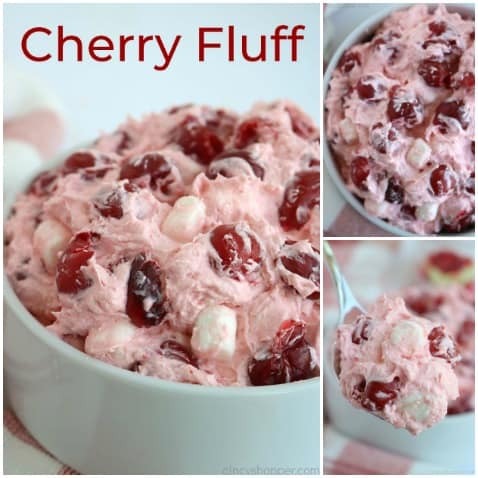 This Cherry Fluff is always a hit with my friends and family and always disappears quite quickly. I will often make a double batch for that reason. The fluff in this salad comes from the whipped topping and the addition of the mini marshmallows. The cream cheese adds creaminess. The pie filling adds real flavor. 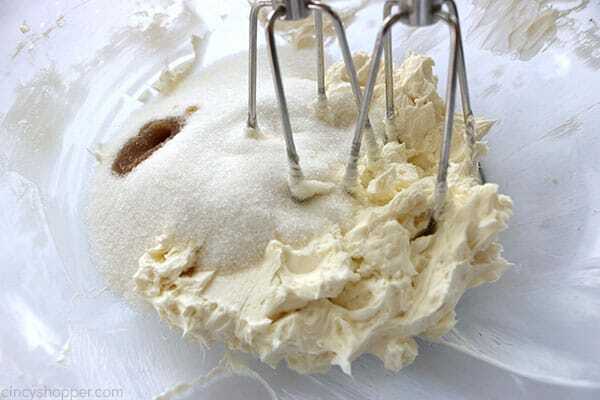 The first step to making this fluff will be to cream your very soft cream cheese with a hand or stand mixer. 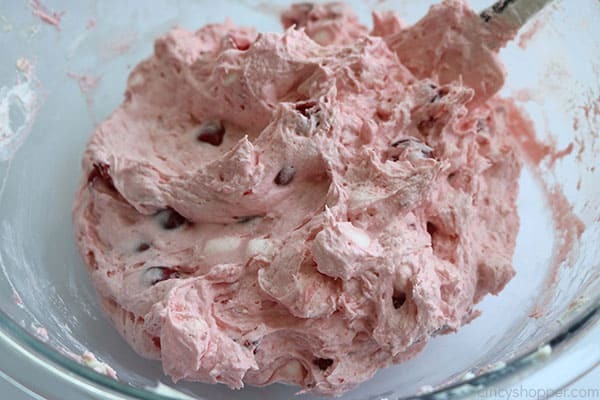 Mix until the cream cheese is very fluffy and creamy. Then, add the sugar and vanilla. Continue to beat until all ingredients are well blended. 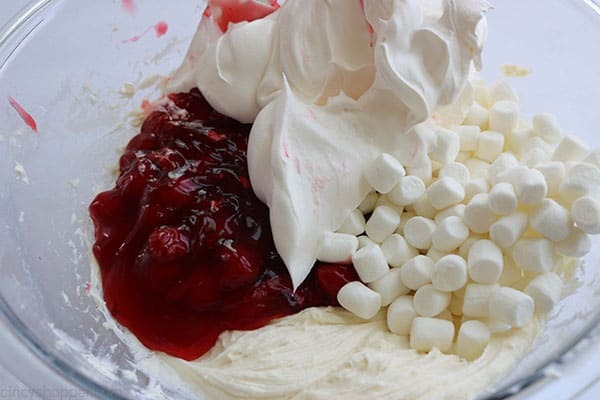 Next, we add the cherry pie filling, marshmallows, and Cool Whip to the bowl. Fold, fold, fold until all of the ingredients are combined, and the color is slightly pink. 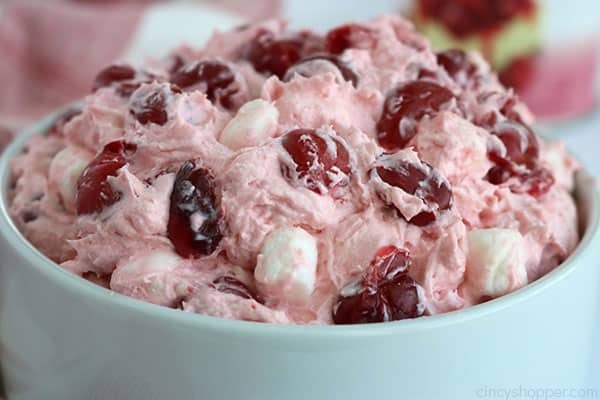 I like to refrigerate my Cherry Fluff Salad for about an hour before serving although chilling is not necessarily needed. Be sure to allow the cream cheese to soften almost to room temperature before beating — the creamier the cream cheese, the better the texture and flavor. 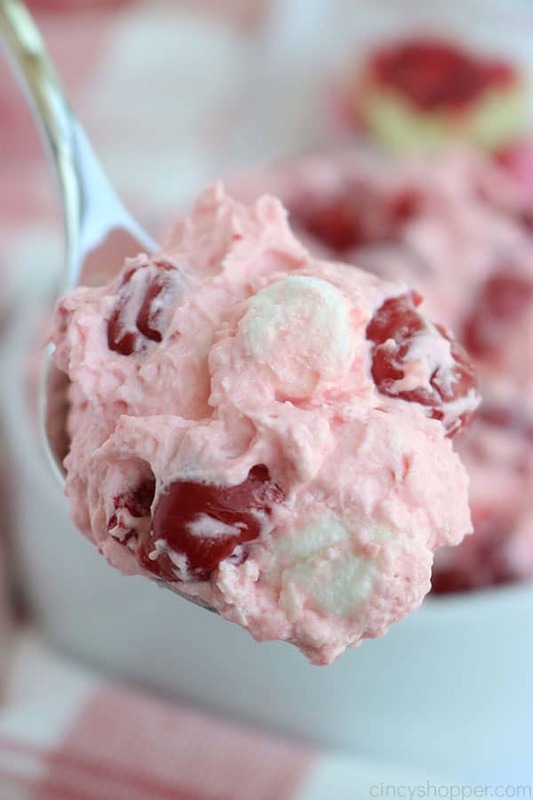 I like to use cherry pie filling for this fluff recipe because I find that most everyone likes cherry desserts, especially cheesecake. But, any flavored pie filling will result in a tasty salad. Go ahead and make your fluff ahead of time. You will find that the fluff holds its flavor and consistency for about 2-3 days if covered and chilled. 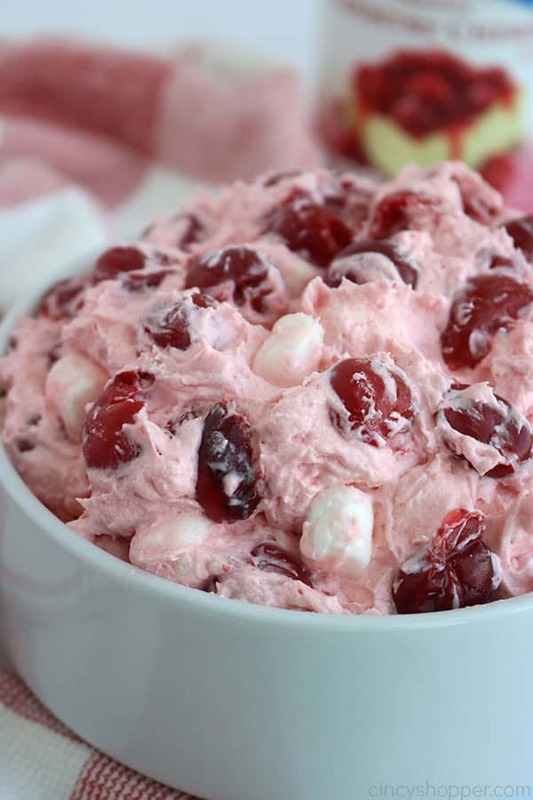 Watergate Salad – A classic recipe that many find delicious and light. 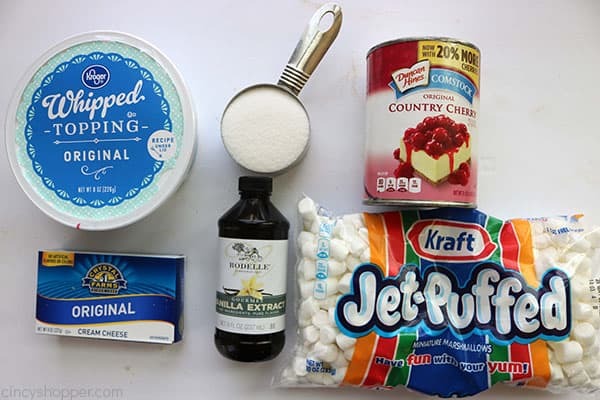 Retro 7Up Jello Salad – This salad can be made in a baking dish, bundt pan or mold. 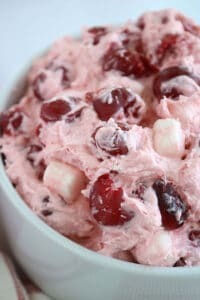 Ambrosia Salad – Very popular with most everyone, very kid friendly. Add sugar and vanilla and continuebeating until well blended. Fold in remaining ingredients until mixed well.